Quite a bit of new clips and scenes from the upcoming release of Fantastic Beasts: The Crimes of Grindelwald were released over the weekend, including some of the first on-set looks with director David Yates and his cast (Johnny Depp, Eddie Redmayne, Zoe Kravitz, and more shooting scenes at Leavesden Studios). Canadian program eTalk released their on-set feature, which started off with a chat with props master Pierre Bohanna at Leavesden, then led through behind-the-scenes glimpses of the movie and new interviews with Redmayne and Ezra Miller on set. Two new TV spots and promos were released by Warner Bros., one of which focused more on the darker side and Grindelwald's team (even including a curious quick shot of Queenie Goldstein having tea with Grindelwald's right-hand woman Vinda Rosier). The segment, along with other short clips from the trailers and teasers, are strengthening the rumor that it may be Queenie (and perhaps Jacob) who turn over to Grindelwald's side. Of course fans will find out beginning November 13th, during the first previews in the U.S. for Fantastic Beasts: The Crimes of Grindelwald. 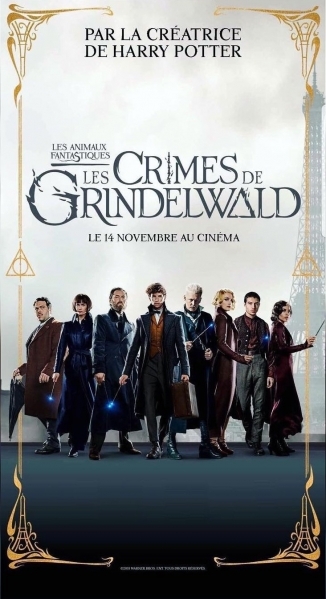 Finally, as part of promotion of the French world premiere on November 8, Warner Bros. France debuted a new poster through their Instagram for the sequel, which revealed new promos photos of the main cast.